Author: Jones Gunn, Robin Set In . . . 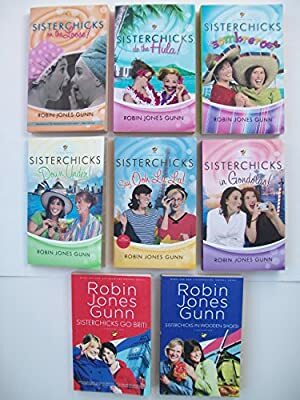 Description: Sisterchicks books are written about women in their middle-aged years crossing the "chicken line" to follow their all but forgotten dreams. Get set for adventure as the sisterchicks visit faraway places. (#1) Sisterchicks on the Loose; (#2) Sisterchicks Do the Hula; (#3) Sisterchicks in Sombreros; (#4) Sisterchicks Down Under; (#5) Sisterchicks Say Ooh La La; (#6) Sisterchicks in Gondolas; (#7) Sisterchicks Go BRIT; (#8 Sisterchicks in Wooden Shoes.